This how-to assumes you have some experience setting up web servers in a Windows environment. Normally this functionality is used for development systems, but a lot of setups could benefit from this, especially those who are constantly changing their HOSTS files. To begin, you're going to need some form of Windows 2003 server, there are a variety of options including the Small Business Server, Standard, and Enterprise editions. 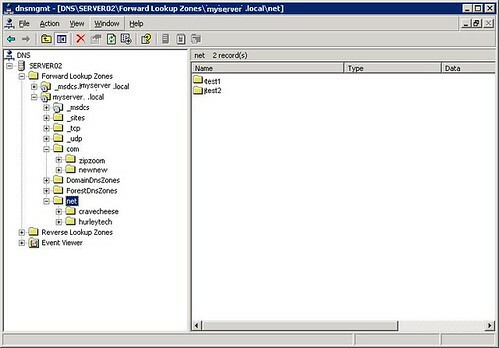 With the DNS microsoft management console up, expand your server(this will be the small server tower icon). Here you'll want to right-click on your servers domain, this will most likely be followed by a .local suffix, such as our example. From the right-click menu, select the "New Domain" option. Once you click ok afte typing in the domain of your choosing, you should see it pop up underneath your server's domain on the DNS tree. If you chose a ".com" address, you will see "com" in the list. If you expand "com" you will find the domains you've created with that suffix. Now that we've created a domain. We can setup our webserver, for our example we'll use Windows IIS or Internet Information Services. "test.google.com" will be put into the host header field. Other than that, setup of the website will remain the same as any other IIS website. Now, to allow your workstatios to be able to browse to these fake domains. You'll need to go to each workstation and change their DNS to point to the 2003 DNS server you've setup. Also, you will have to go into the properties of the network adapter for each and select TCP/IP. Click the Advanced button, and proceed to the DNS tab. Here is where you should see the DNS server address you put in earlier. And finally check the last two boxes at the bottom and click OK. These will register your workstations with your DNS server. Now you should be able to browse to the website test domain you have setup(assuming you created a website). And how will my internal dns handle requests for the real google domain? test.google.com will point to a development server, but where will I end up with http://google.com?